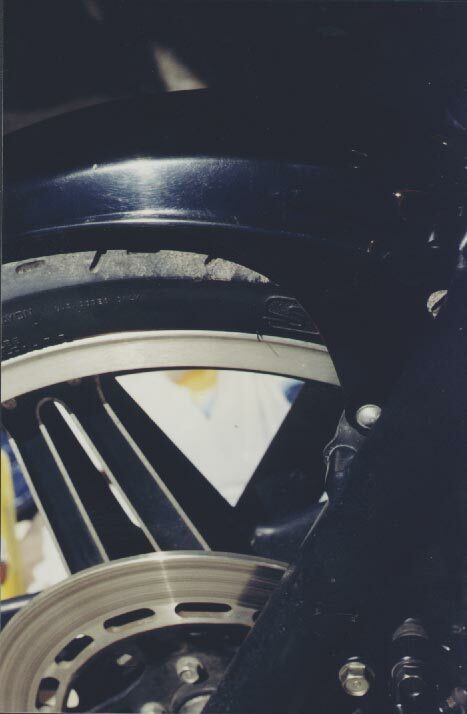 So, you want to make your bike (or car) look the best it can and restore the paint, plastic, chrome, aluminum, stainless steel to its oringinal finish and shine? Well then you’ve come to the right spot to read what to use that will work. 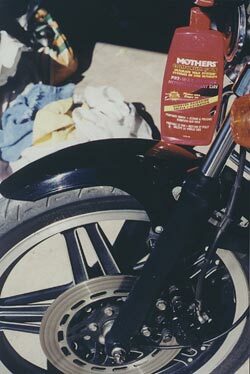 All the products below I have used on my motorcycles. Sometimes its better to see if you can buy a better looking part to restore than what you have. I’ve saved up to 90% (hundreds of dollars savings) off what it would have cost me from the scrap yard! Click on any photo to see an enlarged version. Please read all the steps before going ahead and trying this for the first time. 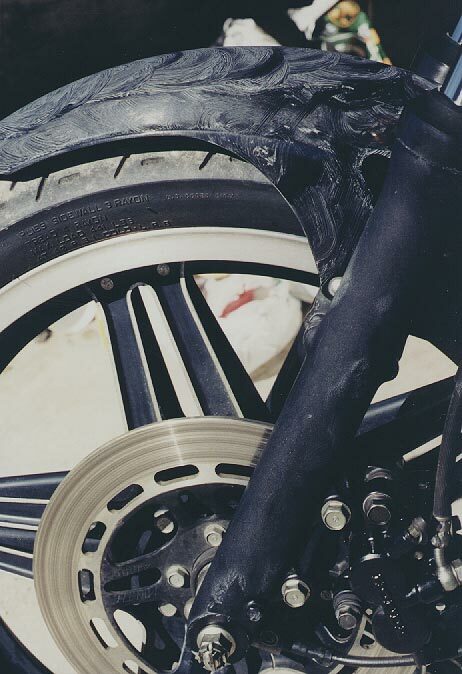 Close up of original un restored Parts (front fender and rear fender). These will serve as our test subjects. As with any foundation, starting right is the best way to start out. 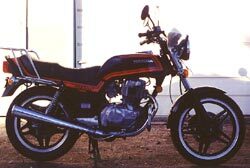 Since the motorcycle will be polished and waxed later on in full you want to get rid of all the old wax (if any), grease, dirt, grime et al. So, this is the ONLY time you will be using harsh detergents and chemicals on your motorcycle. 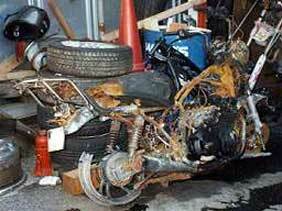 This is the only way to assure a good properly cleaned bike to start off from. 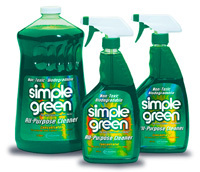 Simple Green (either the House or Automotive verions). I use the spray bottle one but it is so good at what it does, you may wish to buy the bigger one and now and save money later. The only different I found between the Auto and the Household was the mixing ratio. You got more full strenght mix in the Auto than in the Household. I am sure they are the same product. 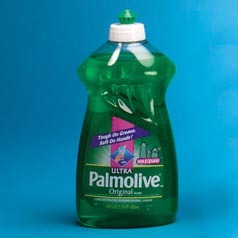 Consumer Reports rated Palmolive Original (not the other versions of Palmolive) as the #1 dish cleaning detergent for the price. Why does this matter to you? You need something that is really good at cleaning dirt, grease and grime away and in large quanities that you don’t mind using at a low price. Since this WILL strip away wax, polish and the like, this is the ONLY time you should wash your bike with this stuff. Hey, atleast you can use it doing the dishes when you are done cleaning your bike!! Oh, and it works REALLY well cleaning the motorcycle and cleaning the dishes. Ok, so you got your chemicals, now you need some scrubbing brushes to attack the non painted areas (note, I said NON-Painted). You do not want to damage any areas that can be scratched. So go to a local K-Mart, Dollar Store, Canadian Tire etc and find some really cheap, all pastic (no metal parts), nylon bristle brushes with long handles (2 is fine). 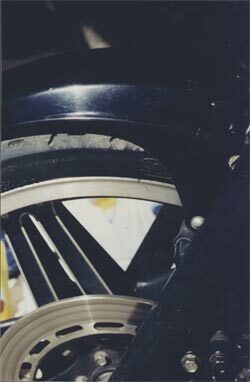 While you are there, grab a hand sized scrubber (all plasitic as well) to scrub the sidewalls of your tires. What to go all the way to do your best? Grab 3 paint brushes (1″, 2″, and 4″), if they have metal parts you will need to wrap those up with masking tape so they cannot scratch anything. Ok, wash your bike now!! Remember to clean that water to get all the dirt out often. It is best to start washing the parts that that could be scratched with the clean water in the clean bucket, then go from there doing the most dirty parts (engine) last. 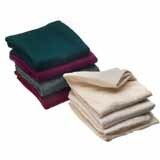 Before you start, make sure you have some clean 100% cotton rags, and 100% cotton buffing cloths. You can use the rags to apply and rub in the pre-wax, and then the buffing cloths to polish it out. This is the only step it is OK to use the rags, all other steps stick to the buffing cloths. Make sure the surface is DRY, and out of direct sunlight. It is fine to apply all the steps in defuse sunlight or in the garage. Start all steps using 2-3 fingers in the cloth and rub in circular motion, making sure to reapply any area that needs more on it. Keep rubbing and applying as the finger area will get dirtier as you go. The results after appling 2 coats of Pre-Wax polish. Pre-Wax Cleaner is formulated to clear the oxidation, embedded dirt, road salts, tar, airborne chemical pollutants, stains, old wax and other surface contaminants that may have built up. Pre-Wax Cleaner polishes out minor flaws and smoothes the paint surface. Apply 2 full coats of Pre-Wax polish. I.e. Apply, wait till it dries, rub off using Buffing cloth and repeat again. (Do not apply more than 3 times since this process actually removes paint). Compaire these photos with the original photos. So far so good eh! Many people believe that polishing is the same a waxing and this is untrue. Just like hand cream and moisturizer does for your skin, polish adds rich polishing oils that feed and nourish a just-cleaned finish. The polish acts like a conditioner for your finish. It eliminates minor imperfections while enhancing gloss and adds a fresh dripping “liquid” finish look. Again, using your Buffing cloth add the polish using 2-3 fingers, switch when the area is dirty. Wait till the polish soaks in and is dry then buff out using a new clean buffing cloth. The polish will not really whiten as it dries, but you need to wait at least 10 minutes (or more) before you remove it so it can soak into the paint. After 2 good coats. Ah, a nice liquid like looking surface! Apply 2 full coats of Polish. I.e. Apply, wait till it dries, rub off using Buffing cloth and repeat again. (Do not apply more than 3 times since this process actually removes paint). Compaire these photos with the original photos. Now we are cooking eh! The last and final step is protecting that liquid looking newly polished finish and the paint below it. That is what a good wax does, it protects all your hard work from being washed, and sun faded away as well as making the paint stay as good as it can for a very long time. 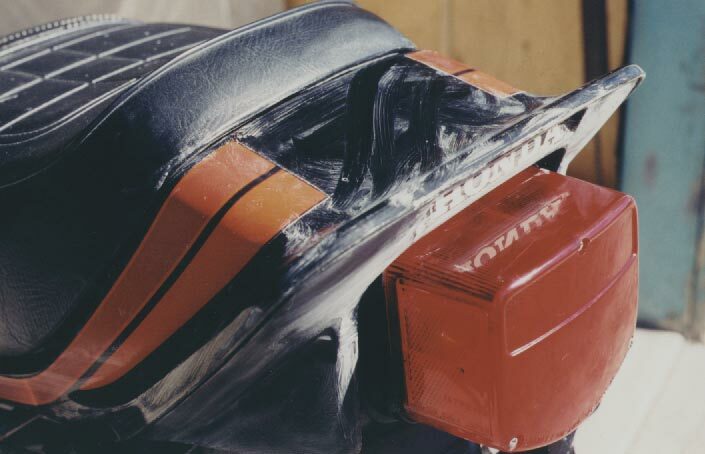 Again, using your clean Buffing cloth add the wax using 2-3 fingers, switch when the area is dirty. Wait untill the wax is dry and then buff out using a new clean buffing cloth. The wax will whiten as it dries, but you should wait at least 10 minutes before buffing it out. Two good coats of wax does wonders in protection and looks! Apply 2 full coats of Wax. I.e. Apply, wait till it dries, rub off using Buffing cloth and repeat again. (Do not apply more than 3 times since this process actually removes paint). Compaire these photos with the original photos. Great job eh! This world famous and internationally awarded high quality product cleans, protects and polishes all bright metal surfaces, e.g., Chrome, Aluminum, Stainless Steel, Copper and Brass. Its abrasive cleaning properties make it ideal for use on heavily weathered and corroded surfaces. REVIEW: Outstanding metal cleaning product. Restores old rust pitted chrome to a very mirror bright finish without the rust. Polishs up Aluminum (e.g. engine cases) to a shine. Highly recommended. Also, its not very expensive to buy either. Before you apply another coat of wax onto your vehicle, consider how well you’ve prepared the surface. Was the paint cleaned first? Our Pre-Wax Cleaner is formulated to clear the oxidation, embedded dirt, road salts, tar, airborne chemical pollutants, stains, old wax and other surface contaminants that may have built up. Pre-Wax Cleaner polishes out minor flaws and smoothes the paint surface. Clean twice a year or as needed with Mothers® Pre-Wax Cleaner—be prepared for Phase 2 and Phase 3. Product #07100, 16 oz. REVIEW: This product impressed me the most in my 1-2-3 step paint restoring process. After using this pre-cleaner wax a few times to remove 23+ years of oxidation (a near impossible job I though), the paint was left looking great! After this product I used the Meguiar’s Polish and Gold Class Wax. Renews and protects all exterior trim. Perfect for use on vinyl, rubber, plastic, flat finishes, yet surfaces need not be black to obtain superior results. Works incredibly well on both smooth and textured surfaces, bumpers, protective and decorative moldings, louvers, air vents, window trim and wiper arms. After applying Back-To-Black, surfaces look new again and will be protected against further oxidation or deterioration caused by harsh elements. REVIEW: Better than Armor All or Simoniz protectant sprays and definitely not a slippery. Works well, but you have to apply it everytime you wash you bike. There isn’t much in the bottle for the price and it is quite runny. Even though it was better than Armour All and Simoniz I still wasn’t very happy with it until I tried Pledge furnature polish (see review). Step 2 of the 3-step Meguiar’s Deep Crystal System. 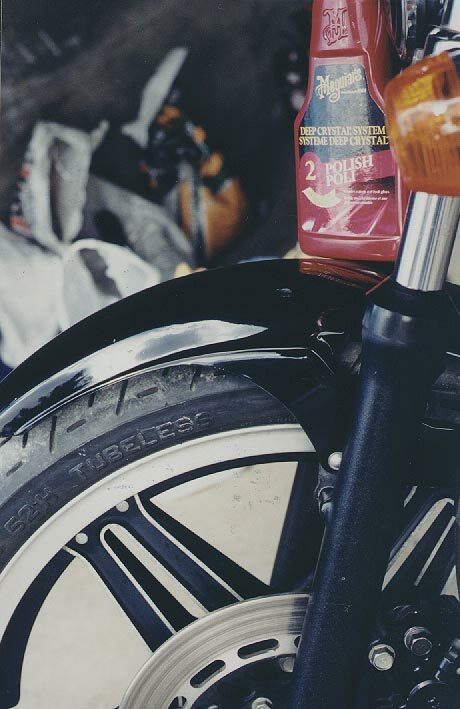 Rich polishing oils feed and nourish just-cleaned finishes. Safe on all paints, whether applied by hand or with an orbital buffer, Deep Crystal System Step 2 Polish acts like a conditioner for your finish. It eliminates minor imperfections while enhancing gloss. REVIEW: Undecided. Product is a runny, grey like liquid. After applying this product to the paint in my 1-2-3 step paint restoration job I honestly didn’t know if it did anything at all for the shine. I think you won’t see anything after using this product, but I guess you have a have a little faith that it is doing what it was made to do. After this product runs out, I’ll buy the Mothers version (step 2 polish) and see if there is any difference. A new standard for incredible shine. In all the years Meguiar’s has been developing car wax, there’s never been anything to equal the brilliance of this latest formulation. Its rich polishing oils and tough polymer protection glide on easily, leaving a durable and stunningly reflective UV-resistant finish. No matter what type of paint you have, Meguiar’s Gold Class Wax will bring out its full depth and richness, while shielding it from the elements. REVIEW: I’m happy with this product, it definitely does work. This was my 3rd step in my 1-2-3 step paint restoration. The shine it leaves is mirror like and deep. While it was pricey, it did a much better job than the turtle wax. But to be fair, this product did cost 6 times as much. Many cars since 1980 have utilized a paint process called clear coat. This clear coat top layer of your car’s finish does not contain any color. It’s this clear coat that adds durability and brilliance to the shine of a car. Clear coats require a special formula in order to provide the perfect shine. 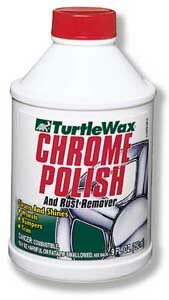 Turtle Wax Super Hard Shell car wax is the ideal car wax for your clear coat car . Turtle Wax’s new improved formula provides the same great shine and protection without hard rubbing or buffing. Today’s modern finishes are very lustrous. But after a while, the sun, water and chemicals in the air can erode the finish and the shine. Turtle Wax Super Hard Shell car wax will bring back the lustrous, mirror like gloss to your car’s finish. This formula has been designed to last up to 12 months of washing and weathering. REVIEW: It works and its cheap. I used this product all summer putting on a new coat every 2 weeks to build up a deep shine. The paint was a bad quality gloss spray paint job and after using this product a few times it looked good! 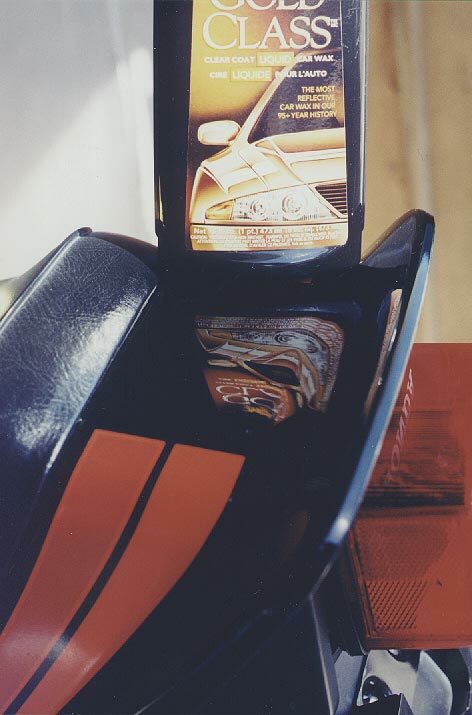 Transforms rusty, tarnished chrome to its original gleaming luster. Cleans and shines wheels, bumpers and trim. REVIEW: I’m not very happy with this product, it never really preformed as it should. It did clean and remove the rust after some hard work but it did leave minute scratches on my exhausts after cleaning the chrome on them over a dozen times using this product. The scratches were not noticeable 3 feet away, up close you could see them and they didn’t go away. But it is cheap to buy.. 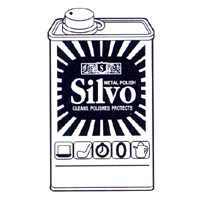 Manufacturer says: Silvo Multipurpose Metal Polish is a creamy liquid polish you can use with complete confidence – it leaves a smooth polished surface and brilliant long-lasting shine with no harsh abrasives. Cleans and polishes sterling silver, silver plate, gold, mirrors and chrome. REVIEW: I used this in the Army to polish up my cap badge, buttons etc so when I saw it for $2.74 at a liquidation store I figured I’d try it on my bike (chrome parts only). Well, it does work on chrome and doesn’t leave any scratches either. I didn’t notice any different over the Autosol polished chrome (which is still impressive) but I come to think of it as “liquid Autosol”. Don’t use this on aluminum or anything but smooth chrome since it is liquid and can find pits to stay in after you finish buffing… Personally I’d stick with Autosol since the paste is easier to control. 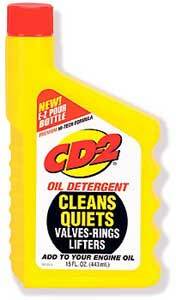 CD-2 Oil Detergent frees sticky lifters, valves, and rings to quiet noisy engines. Dissolves sludge, carbon, and gum to extend engine life. Cleans all internal engine parts for more pep and power. Protects critical engine parts during high speed or stop and go driving. REVIEW: Hummm… Added it and it does thin out the oil. I’d say it would be a 5w oil in weight itself, so use a little heavier oil (20w50 rather than 10w40) if you are adding it. So what did it do? After 1000km the oil was cleaner than normal, the oil filter (WIX) was just as dirty as normal, so visually. The bike ran the same but the clutch wasn’t as happy with thinner oil than 20w50 though. I did add the whole bottle to a full oil change so it was even more concentrated than normal as well. So what did it do? Nothing I could notice visually. I didn’t take the engine apart though. No, I wouldn’t buy it again and I still have 1 full bottle left… what to do with it… Maybe I should add it to our car! haha. Manufacturer says: Actually repels dust; leaves no waxy buildup. Excellent on wood furniture, cabinets, paneling, vinyl and leather. The good qualities in Pledge®, such as better scratch resistance, can be used to a refinisher’s advantage. REVIEW: Ok, don’t laugh at this tip. I learned this one from others on the internet and tried it out myself on my rubber and plastic bike parts. It works, it works great! Better in fact than Armor All, Simonize and other rubber/plastic products I’ve ever used. 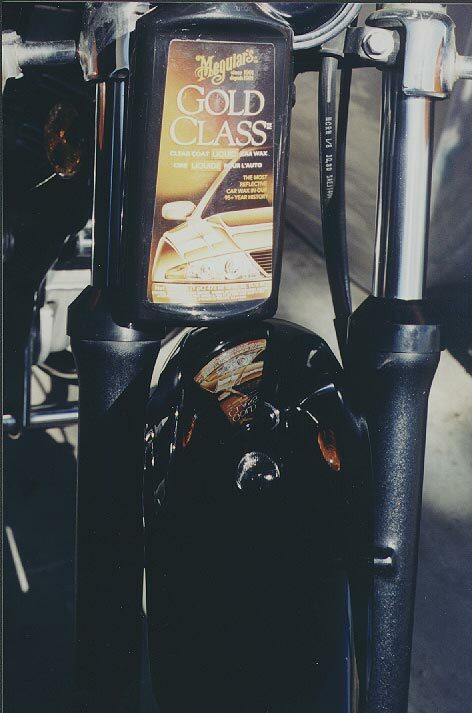 Plus, it leaves a nice lemon scent as you clean the bike! haha. As I’ve said, it works great on plastic of any colour and even on windshields and helmet visors as well. No, it doesn’t turn clear plastic a yellow tint. It works like Rain-X in the rain and makes bugs come off easy as well as the dirt and dust. 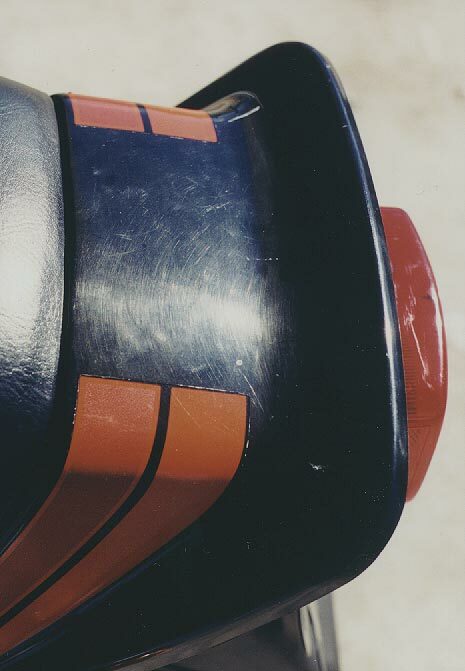 Rubber and plastic become more rich and dark in colour and the richness in uniform. Highly recommended, try it out on your bike. If it doesn’t work like you want then you can always use it in the home. 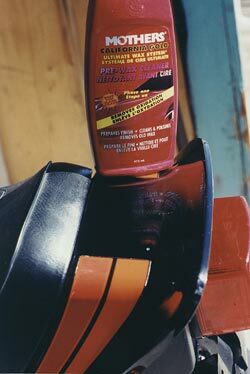 Manufacturer says: The easy way to clean, protect and shine rubber, plastic, and vinyl surfaces. Armor All® Protectant contains a unique, patent pending UV protection system to help block damaging UV rays and slow the vinyl aging process. Armor All® Protectant also contains a special anti-static ingredient. REVIEW: The good old standby. Need plastic shiny, this is what I’d use. Maybe not the choice of all professionals but it worked ok, but never great on older plastic. The shine seemed to vary and was patchy on flat black or old plastic so I switched to Mothers Back-to-Black and then to Pledge furnature polish. If the plastic or vinyl surface has a texture isn’t flat black and is new then try this out, otherwise, try Pledge furnature polish on it first. Becareful what you use it on, it is VERY slippery. The Scotch-Brite® name and reputation continue in a comprehensive product line that provides top-to-bottom cleaning solutions worldwide. We’re the name that more customers trust, with the products that keep on performing. Life’s too short to scrub too long! There’s a smarter way to clean! Use Scotch-Brite® cleaning products for all your cleaning needs, from the toughest baked-on messes to the most delicate surfaces in your kitchen and household. REVIEW: I used the most common 2 sided (yellow/green) cleaning sponge to magically take away rust and other imperfections in metal on my bike. It works great, –> BUT <– you have to be gentle and use the yellow (not the green) side of it unless the yellow side isn’t tough enough to remove the rust or you’ll get lots of tiny scratches. Great tool to make crummy rusted crome into Satin looking chrome! There are dozens of different Scotch-Brite pads on the market so choose one to suit your application. REVIEW: Very effective at wicking away the last of those water drops to make a great looking surface. Safe to use on any material that you are worried about getting scratches on as well. 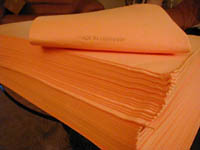 REVIEW: There are hundreds of different sizes, types and manufacturers (like Sundance) of these cleaning cloths. Pick any of them that use 100% cotton flannel/fleece and this will be your MAIN tool in applying all that polish, wax, paste and cleaner. Wonderful product that doesn’t scratch, is smooth and VERY effective. Cheap and last a Looooong time! Don’t forget to wash them (hang them out to dry) to keep them new and effective. As in all things, you really do get what you pay for, but there are great deals to be had out there as well. The three products that I definitely wouldn’t switch off of was the Autosol, the Mothers Pre-Wax cleaner and using a 100% cotton Chamois. All of these are great deals for what they do and they preformed above my expectations. As with the other products, I’m happy with them and will continue using them but will be open to other products to try and see if they do a better job. The only product that leaves me scratching my head is the Meguiars Step 2 polish, I can only guess it does something beneficial to the paint. 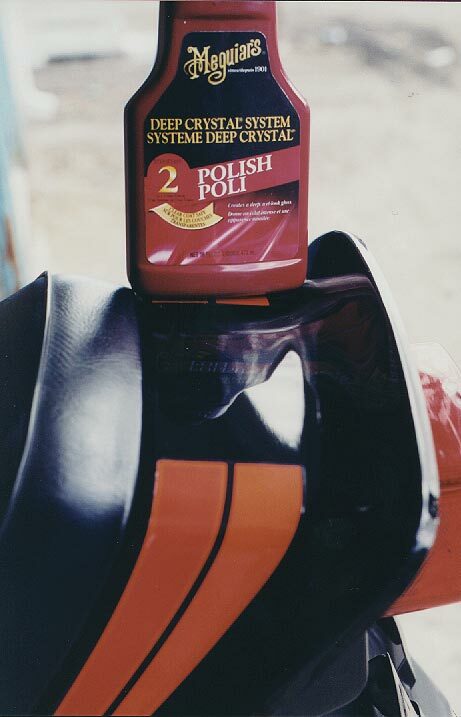 As for products I won’t buy again, that would be the Turtle Wax chrome polish and rust remover, simply because I’ve found something better, Autosol. SeaFoam (Sea Foam) – Link 2, Link 3 – One of the often neglected services is removing built-up carbon deposits and contaminants from the engine, fuel tank, throttle body, and other places where air and liquids flow through on a constant basis. What’s The Difference Between A Polish And A Cleaner? – How Can I Remove Swirl Marks?